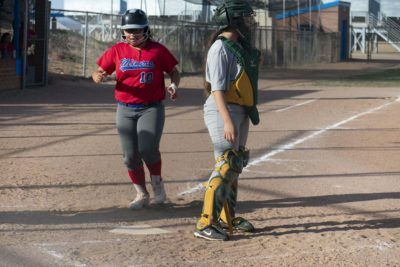 San Manuel freshman Jazmyne Waddell has been extraordinary at the plate and on the mound all season, but nothing has been more impressive than her performance against San Miguel last Thursday in a lopsided 19 – 0 victory last Thursday. The phenom tossed a no-hitter in addition to going 4-for-5 at the plate – including a pair of doubles and homerun – with eight RBIs. She fanned 10 and did not issue a free pass in the five-inning outing. The Lady Miners finished with 20 hits in the game, eight of them for extra-bases, including Waddell’s three, a double and a homerun from Gabriella Estrada, a triple by Aubrey Encinas, and doubles from Samantha Waddell and Priscilla Ivy. Encinas and Estrada finished with three RBIs apiece and Ivy drove in two runs. Beatrice Gomez and Andrea Guerrero contributed with two hits apiece. 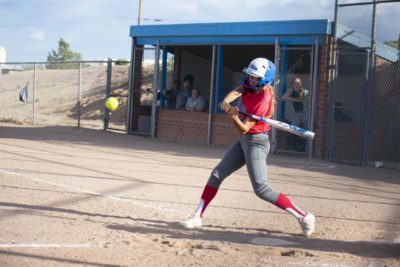 The Lady Miners faced off against Santa Rita last Friday and posted another win, 22-1. Up next: Apr. 10 vs. Coolidge, Apr. 12 vs. Desert Christian, and Apr. 16 at Santa Rita. All games are scheduled for 4 p.m.